LOS ANGELES (WLS) -- The Chicago Cubs won the ESPY for "Best Moment" for their World Series win, but it was comedian and Cubs super fan Bill Murray who walked away with the hardware. 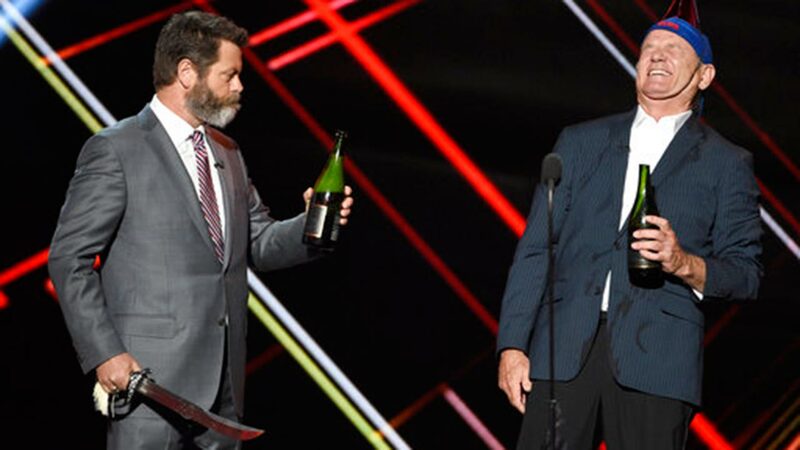 Murray accepted the award on behalf of the Cubs from fellow comedian and Cubs fan Nick Offerman. While Murray was speaking, a masked janitor with a Cubs mop bucket walked behind Murray. Murray then turned around and pulled out a sword and a bottle of champagne from the mop bucket, using the sword to open the bottle. The masked janitor then revealed himself to be former Cubs catcher and "Dancing With The Stars" contestant David Ross, who proceeded to launch into his dance moves. Offerman and Ross each joined Murray in opening a bottle of champagne with the sword.